1. Dream job…realistic and completely unrealistic. I would love to be a midwife. I don’t know if that is realistic or unrealistic. I really don’t know. But I really wish I could do my education over and be a Certified Nurse Midwife. 2. Do you fart in front of your significant other? I try not to. I try desperately not to, but I do not always succeed. Ugh. 3. What’s the furthest you’ve ever traveled from home? How far and where was it? Australia. It’s like a 14 hour flight. I was traveling with a music group, Celebrant Singers, as an interpreter for the hearing impaired. Sign Language in Australia is not anything like American Sign Language, but it is still pretty and when given to the Lord can be used as a mode of worshipping Him. I did three tours with Celebrants, England, Australia and Alaska. What amazing experiences! 4. How do you celebrate birthday for your kids? Family only or friends? … Alternate for those without kiddos: How did you celebrate birthdays as a kid? Right now, we do a mix. We have a celebration with just our own family of 5 and a party with some of their friends, our extended family and our friends. At each age, my hubby says, this is the last party, right? Nope. Birthdays have always been something to celebrate in my family. And as a mom, I am seeing them more and more as a personal milestone. A way to mark how they are growing and changing, a way to celebrate their lives and our life as a family. 5. Fave thing about fall? Just one, honestly? There are so many. The cooler temperatures that allow you to bake and cook more comfortably. Apple Pie. Soups and stews. The leaves changing colors. Hubby and my anniversary. Fall! Wonderful. 1. Do you apologize to your kids if you’re wrong? 2. Do you have a class ring, Letterman’s jacket, or similar obscenely priced high school “must have”? I have both high school and college class rings. I paid for both with my own money. And I’m glad I have them. 3. If you could be one age for the rest of your life, what age would you choose? I think this age, 36. I am comfortable in this age. I love my life with my hubby and my three wonderful girls. The last year has been tough with the postpartum depression, but otherwise, it has been fantastic. Absolutely fantastic. 4. What is your favorite (unused) baby name? We’ve had the same boy name picked out since we first started talking about kids, Levi. As you can see from our family, we have not yet had opportunity to use it. Only the Lord knows if we ever will. 5. If you could make your child like something what would it be? Obeying. Yes, I would have them like obeying. It would cover so many other things. If they liked obeying they would not fight. They would clean their rooms, they would eat their dinner. They would give mama a break when she needs one. They wouldn’t throw fits. Yes, obeying would be a great thing for them to like. But I thought for today I would write a little more lightly. The seasons are changing here. I am loving the sweet beauty of the lilacs as they bloom and it is nice to hear my hubby saying he needs to mow the grass instead of how he needs to shovel snow, but not everything is changing. My oldest, Caitlyn, is much like her daddy in many ways. One way she is like daddy and NOT mommy, is she likes to have her back scratched. And it never seems to manage which season it is. She will stand in front of you for as long as it takes to get her back scratched. And she gives very good directions, go this way, now that, now down, now up, more, don’t stop. Always wants her back scratched no matter which season! What does your child like that is either like you or very different? I didn’t have a chance to pop in Tuesday and show off my work getting an area organized, but I did do something 🙂 And shocked my hubby in the process by cleaning off the staircase up to our room. Putting stuff on the steps is a bad habit I developed growing up. It drove my dad nuts and now drives my husband nuts. Is that what “they” mean when “they” say girls look for someone like their daddy to marry? How is Body after Baby Morphed going? Pretty well. I have continued to do the 30 Day Shred and even ran one night too!!! I missed working out last night and am totally feeling it today…I gotta get down there and workout. Tomorrow I am going to move my workout OUTDOORS. I am going to try cross country skiing for the first time in roughly 20 years. I lost much of my balance when the Multiple Sclerosis got bad. With it went skiing. Now mind, I had not done a lot of it, just once or twice, but I had enjoyed it. For some reason it is something I really missed and am now feeling confident enough to try it again. One of our local parks, Independence Oaks, is offering a two hour ski lesson and ski rental for $10. And my wonderful hubby is going to keep the three kidlets while mama heads out. He doesn’t mind me heading out, but he sure is bummed he is not going to see my adventure. What about 5 Question Friday? Okay, you asked for it, here it is. 1. What movie could you watch over and over again and not get tired of? Guess I don’t feel like narrowing things down today. 2. What’s your biggest pet peeve right now? Hearing my child say “I don’t like that.” So now they have to say, “I don’t prefer that.” Same obnoxious thought when they are rejecting dinner, but it sounds cute when they say such big words. 3. If you had to describe your best friend in five words or less, what would you say? Does my hubby count? A funny, sweet, strong, smart companion. 4. If you did not have to worry about money or go to school what would you do for a living? Either a stay-at-home mom or a midwife. 5. What is your one “splurge” item, that you will always buy, no matter the cost? Diet Coke! I considered giving it up last week. Then I woke up. The only time I ever gave it up was at the end of my pregnancy with Patrice when she kept going breech. I thought maybe the caffeine was making her too hyper. So I gave it up for about 2 weeks. We brought some with us to the birthing center so I could have one right after she was born! And what would be a post without mentioning my wonderful midwife? I saw her yesterday and she was as always her wonderfully encouraging self. I am so thankful for her investment in our family. It goes up the weekend before Christmas and if I could, it would come down today, but “Grandma with two doggies” (my mom) is coming down to celebrate Christmas with us next weekend and I promised we would keep the tree up. Sue has discovered taking the ornaments on and off and is making us a bit crazy. 2. Do you have plans for New Year’s Eve? We’ve been invited to a family party, but it is a ways away and we would have to stay the night, so we will likely just veg out here. I’ll make some carmel popcorn and we’ll have some fun. 3. Do you have any New Year’s resolutions? Hubby and I are going to start eating weight watchers style again. I also am going to start exercising in the morning before work (eeek, 4:30 am that is) and I am going to figure out how to get the kids to daycare without yelling. 4. How did you spend New Year’s Eve when you were younger? I don’t remember, but if I had to guess I would say we went over to our friends house where my folks played cards while us kids watched TV. 5. What was the best way you’ve ever spent New Year’s Eve? I was engaged once (to a guy I did not end up marrying). He proposed on New Year’s Eve. At the time it was awesome. But, Praise the LORD, that relationship did not last, so I guess it wasn’t that great, huh? Truly the best is just being surrounded by my kids and hubby. What are some of your New Year’s thoughts? Hop on over to Mama M and see what others are thinking. After you take a gander at these cuties. We open them Christmas Day. I remember my oldest daughter’s second Christmas we actually opened gifts over about 5 days. I didn’t want her to get too overwhelmed and not enjoy what people had chosen for her, so we would open a few, then a few the next day, so on and so forth. This year will be a little like that. My mom will be coming down a week or so after Christmas, so we’ll have that time with the grandparents then. I like it that way. I know as a kid I liked celebrating on different days. Hands down, candy cane cookies. Kind of a plain tasting cookie, but oh I love them. The hints of almond are fantabulous! 3. What’s the worst Christmas gift you’ve ever received? Oh there were the things people gave me that didn’t fit, and at the time that seemed like such a tragedy, but honestly, I don’t remember any of them. I just remember being very loved by my family and friends who took the time to choose gifts or give me money or certificates. The gifts might not have been perfect, but they were given out of love. Hmmmm, have to do some research to come up with the name, but I know it is by Trans Siberian Orchestra. And includes Pachel Bell’s Canon. One. Though we did two one year…my sweet hubby decorated a tree in diet coke cans and pictures one year. I LOVE<3 Love <3 diet coke. It was super fun to have that one. This year honestly, it doesn’t feel like Christmas is just around the corner. Who knows when we will do a tree. Sue’s first Christmas was a snooze fest. Now hop on over to Mama M to see her answers, and those of others, on these fun Christmas thoughts. 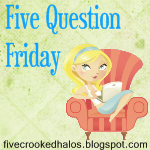 Fun on Fridays is a 5 Question Blog Hop. Once you have read my answers, head on over to Mama M’s and check out what others have to say. 1. What’s on the top of your holiday wish list and why?! A serger I think. I have been sewing a lot more recently and a lot of projects suggest using a serger. No, I would rather have time to run. We got a treadmill for our anniversary gift and I am really enjoying it. Soon I will have to go back to work and it will be harder to find time…Yes, time to run is what I want for Christmas! My oldest daughter rolled over for the first time the week of Christmas. That was a cool gift. I was so afraid she would do those first things at daycare, so was thrilled when she did that at home with me! My other fave was the year my hubby bought me a freezer. Yup. I was nursing and pumping for our oldest daughter and was worried about storing my milk. It meant a ton when he got me a deep freezer for storing pumped milk. Who knew a question about Christmas presents could be TMI, huh? I am so proud, this is the question I suggested for 5 Question Friday! Now on to my answer, I would be a Certified Nurse Midwife. I am tempted to go back to school now, but with my English degree I would need to basically start my degree over, get my nursing degree, then my masters in midwifery. So my second choice is to become a birth doula. I have taken the classes, now I just need three births to attend. Do you know anyone having a baby who would like to have a doula? Please let me know!!!! We don’t put our tree up until about a week before Christmas. It drives me batty to tell the kids not to touch it, so we wait…less time for the tree to stress us all out. But we have started the outside decorations. I like Easter. I like celebrating the resurrection of Jesus and I love knowing spring is here or just around the corner! A special thanks to Lori at Dolly Outfitters for restoring my blog design. I know she is crazy busy with her business right now. I really appreciate her taking the time to redesign my blog a few weeks ago and then yesterday she restored it after I messed it up! Here are my thoughts on Mama M’s 5 Question Friday. Check out her blog hop for more fun! I, like Mama M, choose to birth all natural, so that hurts, like wow. But it is an empowering pain. Really. So, I would say that is my most painful thing, but it is too rewarding to be considered truly painful. So, I’ll chose pancreatitis as my really painful thing. As some of you may know, last year I had an outpatient procedure that went all wrong. Some of the dye got in to my pancreas and caused pancreatitis. 9 days I was in the hospital. It was horrible. Morphine and some more powerful drug took the edge off it, but it was bad. And it made eating or drinking food painful for a long time! Well little Miss Patrice is 3 months old. My sleep comes in chunks, but I think if I add it together I get about 6 hours, but that is while I am still off work. Once I go back, that number will likely be lower…uggghhh. I don’t remember. Santa Claus used to come to my great grandma’s house on Christmas morning while all the family was there. We all talked to him and sat on his lap. Little did I know it was MY dad dressed up in there!!! He would drop my mom and I off and then say he had to go back home to put wood in the furnace (at that time my whole family heated our homes with wood, so it was not unreasonable someone was often running home to put wood in a stove), change into his suit, get white make up in his beard and mustache and head back to delight us kids. My mom did not tell me for several years it was my dad, and my dad was mad when she did. How cool is that though? Even after Santa Claus was out of the picture, my mom waited until I went to bed to put out my gifts. One year I decided I wanted to be Santa. So I set my alarm, that was incredibly loud, to go off at 1 in the morning. I did not hear it. It rang and rang. Finally my mom came and woke me up so I could go put the gifts I had for my mom and dad under the tree! Another year, money was really, really tight. There wasn’t going to be much for Christmas. My mom was great at finding lots of little things so my sisters and I had gifts to open. We got toothpaste and toothbrushes, undies, one year pencils with our names on them and lots of yard sale treasures. And normally a doll or something. But this year was going to be smaller than any before. But someone decided to be “Santa” that year. My Little Ponies were popular and someone gave me a My Little Pony barn and ponies. It was so cool. No one has ever fessed up, so that year, I KNOW “Santa” came to my house. Cloudy with a Chance of Meatballs. It is my absolute favorite children’s book. They did a good job with the movie! Thanks, Mama M for bringing up some great family memories with your questions! The above question about Santa started a conversation between a friend and I facebook. We both have young children. I asked how her family handles Santa Claus and focussing on Jesus at Christmas. I really appreciate her input as we navigate this same issue with out kids. I wish my kids could be oblivious to Santa, but we live in this world and even this morning they asked to watch a cartoon that includes Santa. We tell them Santa is a fun part of Christmas but what we celebrate is Jesus. Toward this end, I found a great book, Santa are you for Real? that gives a very simple, fun explanation of the history of Santa while talking about the importance of Jesus. You can use the following link to find it and other great resources. I again liked the questions from Mama M. Hop on over and check out her blog fun. A 1983 Buick Skylark. It was two-tone blue. It needed an engine when I got it, so had to buy one from teh junk yard. Didn’t have the money on my own, so my dad floated me a loan. I was slowly paying him back, but boy did that debt weigh on me. But that year, my Christmas present from my dad was forgiving the loan. I remember him laying on the couch half a sleep and him saying it so nonchalantly…and I ran over and gave him a big hug! Well there isn’t a Barney song I don’t know, but my 2-year-old and 3-year-old love it. So, ultimately I love it too. It makes them happy, it makes me happy. 22 stitches., 19 above my eye and three over my top lip. I was driving my moped to work when I was 15. I went off the edge of the road, and when I tried to come back on, I hit the lip and wiped out. The mirror shoved my glasses up to my skull. Thankfully some guy stopped and picked me up. I guess I was bleeding a lot…I realized later he took his shirt off to give me something to put against my head. He took me to the closest hospital (not one you wanted to be at). And this guy who I did not understand, kept saying “we need a plastic guy.” I thought he was saying platic guide, like he needed a guide to know how to put my face back together. My parents were out of town, and my aunt came. They kept wanting her to sign a paper saying they wouldn’t be liable for what I looked like when they were done. (Thank you Aunt D for not signing that). She cleaned the blood off my hands and kept me calm until my parents got there. My dad couldn’t bear to see me, but before he had to leave the room, he told that doctor, if she needs a plastic surgeon, then get her to one…so I went by ambulance to a much better hospital…22 stitches and a broken nose later, they had done things so nicely, very few people today I notice where I got all those stitches. Check out this blog carnival on Mama M. It is a little bit of fun and only takes a little bit of thought, perfect for a Friday! I went to several different week long camps. I loved the Free Methodist Church camp in Manton! Went every year from age 9 to 16, then was a counselor for a couple years after I turned 18. That is where I found out Jesus wanted to live in me. I was 9, so the memories are a bit vague, but I know there was a puppet show where they talked about Hell. I thought it sounded scarey, so I wanted to go to Heaven. And while I still think Hell sounds scarey, and Heave is much preferred, I am glad there is more to the Christian walk than staying out of hell. I’m glad He walks with us every day. I see so much pain in lives around me, of those I know and those I don’t, and honestly don’t know how people face it without Jesus. Some of it is HARD to face with Jesus, without Him, I would be a complete basket case! I also went to 4-H camp. LOVED it. Had one of the coolest camp counselors names Lisa. She was awesome, the fun activities were fun. (If you put your elbows on the table during meals, you had to stand on a chair in front of everyone and do something silly, mine was barking like a seal; I am a great seal!) The crafts were cool, the polar bear swim in the morning was even COOLER, but in a very different way. One year I went to Girl Scout camp. I hated it. I don’t know if it was the camp or was the fact that it was the third one in a row that summer, but it was not fun. I don’t remember why, I just remember it was not fun. Oh probably lots of things, but I try not to notice or remember them. I think one is my obsession with Cafe world and Farmville on facebook. He doesn’t get it, but I use it as my replacement for TV. Or to do while watching TV. I get bored while watching TV. “I Loved Her First” by Heartland. It has been one of my favorites since I first heard it after Caitlyn was born. It is a beautiful story from a daddy to his daughter’s future husband, how no matter how much he will love the daughter, the daddy loved her first. 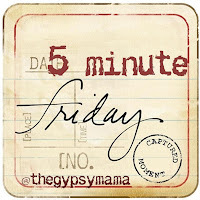 Mama M does this blog hop, 5 Question Friday on, well you guessed it, Fridays. So here is my attempt to join in. I found it on my friend Lori’s blog. 1. Have you ever had a celeb sighting? Why yes, I have. I was headed out to California with my then 15 month old to visit my cousin when I saw Bob, the trainer from Biggest Loser, in the airport. He ended up being on our flight. He chatted with several people and seemed friendly. He was probably relieved to see all the babies on that flight headed back to economy while he was safely in first class! And btw, he is even skinnier in person then on TV! 2. What temperature do you keep your house? We keep it about 72. My hubby would probably prefer it a little lower and me to wear more sweatshirts, but we have a 3 1/2 year old and a 2 year old who insist in running around in dresses all the time. I dress them more appropriately, but one way or another they manage to find dresses and strip down. 3. Do you notice dust at other peoples homes? Hmmm, never thought about it so I guess not. 4. What’s the worst job you ever had? Housekeeping at a ski resort. Walking in on that guy totally naked spread eagle was not my idea of a good day at work. 5. What is your most sentimental possession? Hmmm…I would have to say at this point it is my wedding dress. As a mama, it probably should be something from my girls, but right now I can’t think of any one thing.